© Mark Wilson/Getty Ronny Jackson meets with Sen. Jon Tester on Capitol Hill on April 17, 2018. According to copies of internal documents obtained by CNN, Pence's doctor accused Jackson of overstepping his authority and inappropriately intervening in a medical situation involving the second lady as well as potentially violating federal privacy rights by briefing White House staff and disclosing details to other medical providers -- but not appropriately consulting with the vice president's physician. The vice president's physician later wrote in a memo of feeling intimidated by an irate Jackson during a confrontation over the physician's concerns. 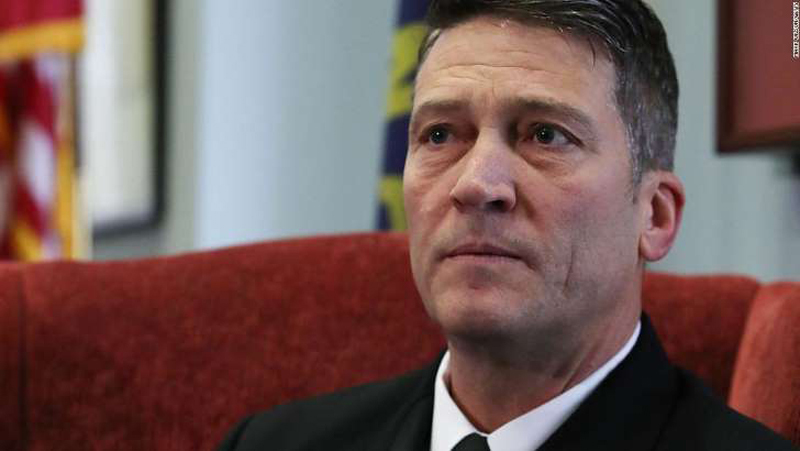 The physician informed White House officials of being treated unprofessionally, describing a pattern of behavior from Jackson that made the physician "uncomfortable" and even consider resigning from the position. After Mrs. Pence's physician briefed her about the episode, she "also expressed concerns over the potential breach of privacy of her medical condition," the memo said. Karen Pence asked her physician to direct the vice president's top aide, Nick Ayers, to inform White House chief of staff John Kelly about the matter. Subsequent memos from Pence's doctor suggested Kelly was aware of the episode. A White House official said that Ayers informed Kelly and White House deputy chief of staff Joe Hagin about the situation and they said Pence's doctor should report the matter through the appropriate medical and military chains of command. Alyssa Farah, press secretary for the vice president, said Pence's physician "brought the issue to Mr. Ayers, who appropriately referred the matter to the proper channels." Farah added that Mrs. Pence "has been briefed on all the facts related to a private matter regarding her health care. She is grateful for the professional care she received from all White House medical personnel who resolved the matter quickly. She considers the matter closed and has no further comment on the situation." The vice president's physician did not respond to multiple inquiries seeking comment. A White House spokesman declined to comment. The memos were provided to CNN on the condition that the vice president's physician not be named and that the memos not be published. The documents were provided last fall to senior White House officials, including Ayers and Kelly, a source familiar with the matter said. Jackson, who had been Trump's lead physician and was also Trump's pick to head the Department of Veterans Affairs, withdrew his nomination last week after allegations surfaced of professional misconduct. Trump and Jackson have furiously denied the allegations, calling them an attempt to smear the reputation of a Navy rear admiral and respected White House physician. "He served 3 presidents," Trump said of Jackson Saturday evening at a Michigan rally, decrying "vicious rumors" against him. "President Obama said he was fantastic. President Bush said he was fantastic. I say he's fantastic." Current and former coworkers have accused Jackson of abusive behavior and professional misconduct in interviews with Democratic staff on the Senate Veterans Affairs Committee, which sources briefed on the matter say has investigated those episodes as well as the one involving Karen Pence. The Senate Armed Services Committee, which is considering Jackson's promotion in the Navy to become a two-star admiral, is aware of the incidents, according to sources familiar with the matter. The detailed memos provide a vivid account of both the incident and Jackson's alleged actions afterwards. In one of two tense encounters described in the memos, Jackson made the vice president's doctor feel uncomfortable with his "accusatory" tone, "unprofessionalism" and "intimidating" and "aggressive" behavior during their private meetings. Jackson told the doctor to "let the issue go" and to "let things go ... if I am to succeed in my career," the physician wrote. "This meeting summoned by Dr. Jackson appears to have been in retribution for me verbalizing concerns over the protection of the SLOTUS' medical information and his inappropriate involvement in the decision-making process of her care, which is consistent with previous behavior that I have received from him in the past," the memo says, referring to the second lady of the United States. "This unprofessionalism fosters a negative command climate that removes any opportunity for open, professional discussion." Jackson and the vice president's physician have long had a "strained relationship," according to a former White House medical official. The issue involving Karen Pence arose September 8, 2017, when a medical situation required her to be taken from Camp David -- where the President was slated to meet with his Cabinet -- to Walter Reed hospital. Even though Jackson is responsible for caring for Trump, he intervened in the situation involving Mrs. Pence, leading to "an inadvertent disclosure of SLOTUS' medical information in a situation where ultimate discretion was of utmost importance," according to the memo, which does not describe the information disclosed. Jackson asked for several reports on her condition from the physicians who initially treated her at Camp David, though the physician noted it was done "without malicious intent to circumvent their medical knowledge." Jackson then shared information with the senior medical providers involved in the matter, and according to the memo, briefed "multiple parties" on Trump's White House staff "without specific consultation from the physician to the vice president," prompting the concerns that he disclosed Mrs. Pence's private information. He made an order to call in the on-duty specialist at Walter Reed and made plans for her evacuation from Camp David, according to the memo, though he later denied doing so in a private meeting with the physician. On September 11, 2017, Pence's physician briefed Ayers about "this breach of her patient information" under the federal law known as the Health Insurance Portability and Accountability Act, or HIPAA, by disclosing information to various parties. The physician was later directed by Mrs. Pence to tell Ayers to relay the information to Kelly, after the second lady expressed concerns about the potential her medical information was disclosed. "Dr. Jackson stated that it is not always possible to adhere to HIPAA at the White House," the memo said. The memo said that Jackson asserted to the physician that "he must be involved" in medical issues at Camp David and Walter Reed because they are "presidential assets" -- even if those medical issues don't involve the First Family. The White House has pushed back against previous suggestions that Jackson may have violated the privacy law while serving as a physician to the President. "Dr. Jackson's record as a White House physician has been impeccable," press secretary Sarah Sanders said at a press briefing last week. "In fact, because Dr. Jackson has worked within arm's reach of three Presidents, he has received more vetting than most nominees." But Jackson's behavior towards his colleagues -- particularly people who worked for him in the White House medical unit -- has also come under sharp scrutiny. According to the memos, the physician had two contentious meetings with Jackson. In one meeting, the physician wrote, Jackson "expressed anger" that White House officials -- including Kelly -- were aware of the physician's concerns over his involvement in the medical situation involving the second lady, the memo said. The next day, Jackson had another tense encounter with the physician, according to the memo. Jackson said that Kelly was "good with him and everything" -- and Jackson urged the doctor to let the matter go. The vice president's physician continued to raise concerns over Jackson's behavior, even suggesting resigning to avoid seeing him. After being informed of his "intimidating" behavior, Jackson "concurred with that statement, and responded that even his wife tells him he can be perceived as intimidating," the memo said.